Bill Clinton sent emails while president -- 2 of them! Bill Clinton did many things while president. He enacted the North American Free Trade Agreement. He reformed the nation's welfare policy. He got impeached. He created a budget surplus. And then he left office with a higher approval rating than any president since World War II. I sent a grand total of two emails as president: one to our troops in the Adriatic, and one to John Glenn when he was 77 years old in outer space. I figured it was OK if Congress subpoenaed those. 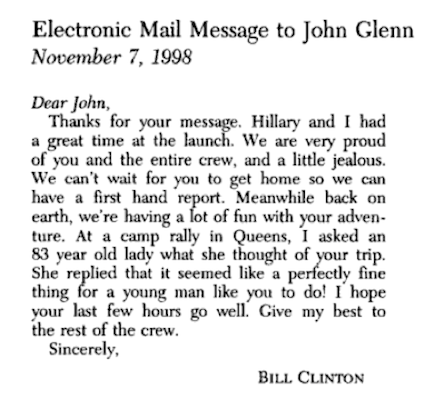 Here's the "electronic message" Bubba sent to John Glenn. It's now printed in a book.